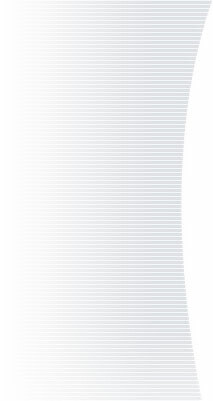 LEAGUE OF WOMEN VOTERS, U.S. 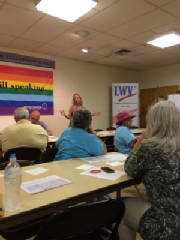 The LWVSWIN Redistricting Committee usually meets on the second Thursday of each month at 3:30 pm in the small conference room at Central Library. Their next meeting is April 11, 2019. 2020 is the next census. That means WE, the citizens of Indiana, need to keep the pressure on our state legislature to move legislation that will put an independent, transparent, fair Redistricting Commission in place for the redistricting that will occur in 2021. Indeed, this past year even Gov. Holcomb noted that Indiana should reform its redistricting procedure. YOU need to contact your Indiana state Senator and Representative. Because of redistricting decisions made in 2011, many districts in Indiana are non-competitive within and/or between parties, which means we do not get to choose who represents us. Instead, the legislators drew the districts in their favor and, chose who can vote for them. It also means, because they have “safe (i.e., non-competitive) districts” that they can pursue their own legislative agendas and ignore action on the bills that many, if not most, of their constituents favor. 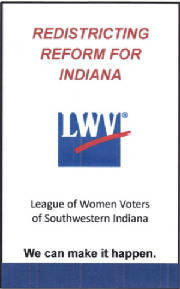 League of Women Voters Indiana, Common Cause Indiana, Hoosier Environmental Council, WOMEN4CHANGE, and many other groups are working together for non-partisan, fair, and transparent redistricting. Cities and counties, including Evansville and Vanderburgh County, have endorsed resolutions supporting Redistricting Reform. This year three redistricting bills have been submitted. SB91, the most comprehensive of the three bills, proposes a.) establishing a redistricting commission to create, take public input on, and recommend plans to redraw general assembly and congressional districts; b.) creating a redistricting commission nominating committee to evaluate applicants for the five non-legislative seats on the proposed commission; and c.) establishing standards to govern the commission and the agency that will create the redistricting plans. SB91 also provides for a meeting of the General assembly to enact the redistricting plans before October 1 of the redistricting year, 2021, i.e. the year following the decennial census. It would repeal the current law. SB91 is not perfect but is an improvement over the current procedure in which the party “in power” in the state legislature draws the district lines. Stay informed, write to, email, and talk with your Indiana House and Senate legislators to encourage their support for legislation that establishes a nonpartisan, independent, transparent Redistricting Commission and procedure during the 2019 legislative session. The address for all state legislators is 200 W. Washington St., Indianapolis, IN 46204; phone numbers are available at iga.in.gov then “find your legislator”. Talk to them in person at Meet Your Legislators and the Town Halls. An LWVSWIN resolution calling for an independent redistricting commission in Indiana was passed by the Evansville City Council on 9/11/17. The Vanderburgh County Commissioners passed a similar resolution on 10/3/17. Our Opinion: Maybe Next Year on Redistricting Reform? The signer of the Declaration of Independence / vice president / powdered-wig enthusiast is the namesake for “gerrymandering”: the act of slicing political districts into politically advantageous shapes. He was born July 17, 1744, and the crowd at UCC gathered on Monday for two reasons: to kind-of ironically honor his birthday, and to protest the very thing that made him famous. hey even had cake and punch. 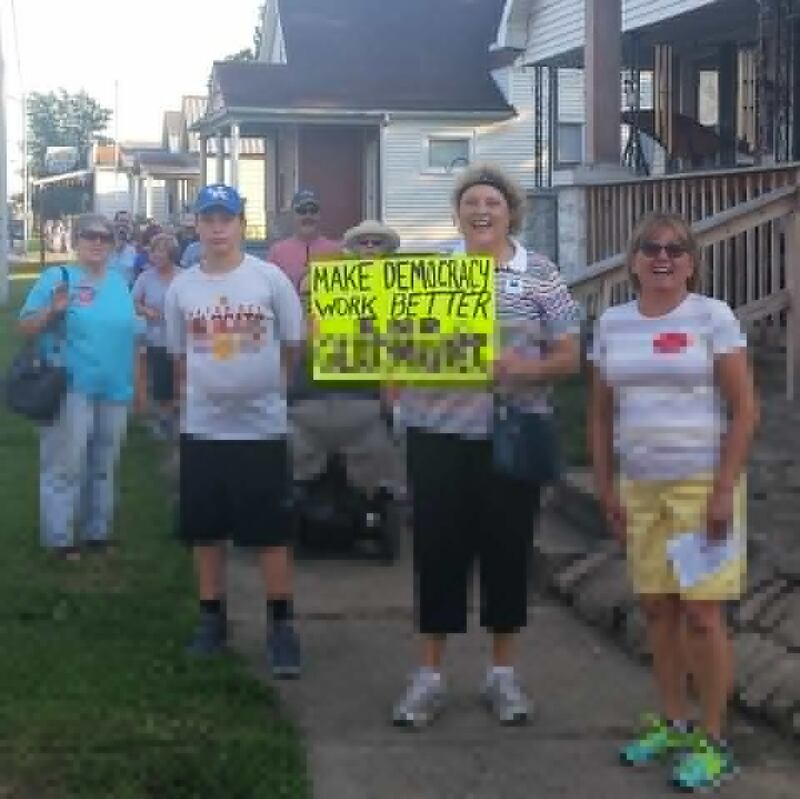 Several dozen folks – from older women to chatty kids -- took part in the state’s first Gerrymander Meander, put on by the League of Women Voters. 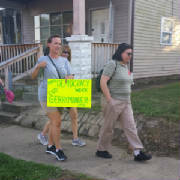 From St. Lucas, volunteers walked through Jimtown in 90-degree heat, sweat stains darkening t-shirts that advocated for a fair electoral system. Vaughn, the policy director for Common Cause Indiana, drove from Indianapolis for the event. She’ll turn up in Bloomington for another Meander on Saturday, all leading to a “big rally” at the statehouse on July 17. 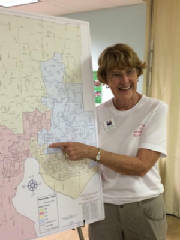 She worked with local League of Women Voters reps Kathy Solecki and Ann Ennis to put the shindig together. She said that while the latest batch of redistricting gave Republicans a massive advantage in the state legislature, the issue itself is nonpartisan. The majority party in Indiana reworks districts after each census. Republicans boast 70 of the 100 seats in the House. Before the last redistricting, Democrats controlled the House eight out of 10 years between 2000 and 2010. And in the Senate, well, “blood bath” only does it justice if the bather is an African elephant. As of this year, the GOP controls 41 of the 50 seats. 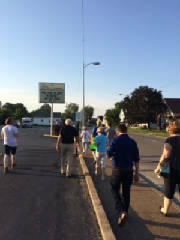 After Vaughn’s talk, walkers flooded the jagged sidewalks of Jimtown. Solecki seemed to be everywhere, pointing out gnarly bulges in the concrete and asking everyone to watch their step. On Baker Avenue, a shirtless fellow twinkling with sweat noticed the large group carrying bright neon signs and stepped down from his porch. “What are you all doing?” he asked. WHO: League of Women Voters of Southwestern Indiana and St. Lucas UCC invited the local community of all ages, races, ethnicities, creeds, and genders to learn about and improve the power of a vote. WHAT: Options including taking a 2.1 mile “meander” along cthe hoppy boundary of IN House Districts 77 and 78; or remaining at St. Lucas Church to learn more about how Indiana district lines are drawn for elections. WHERE: St. Lucas UCC, 33 W Virginia St., Evansville. 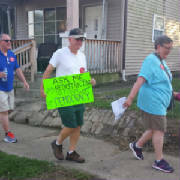 WHY: Indiana state voting district rules allow legislators in power to draw voting districts. Hundreds of groups and thousands of people around the state are pushing for non-partisan district mapping. This event raises awareness on the topic. And More WHY: Elbridge Gerry – the dubious and infamous father of Gerry-mandering was born in July. We walked in his dust. Citizens plan to continue to fight for an Independent, nonpartisan Redistricting Commission in Indiana and to make the 2018 session of the Indiana legislature a referendum on redistricting reform. Many districts around the state are non-competitive. Often our citizens do not have a true choice of candidates, either within or between parties. 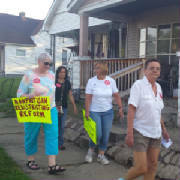 In Indiana The League of Women Voters, Common Cause, Hoosier Environmental Council, Citizens Action Coalition, Enterprise Republicans, Women 4 Change, Friends Committee on Legislation, and others, are committed to helping ensure that redistricting is done in a non-partisan, fair, and transparent way. In addition to the cities and counties in Indiana that have passed resolutions endorsing redistricting reform, the Indianapolis Chamber of Commerce recently endorsed the resolution for redistricting reform. Indiana House Bill 1014 was the redistricting reform bill (co-sponsored by Speaker Brian Bosma (R) and Rep. Jerry Torr (R) that followed recommendations of the Special Interim Study Committee on Redistricting Reform which met during 2016. As reported in a Courier Press article 2-20-17, HB1014 was heard in committee on Wednesday, February 15, 2017 but not brought to the floor for a vote. What is encouraging is that a committee member who had been unsure about the bill indicated that the great citizen support he witnessed led to a decision to support it, had a vote been held. Were others willing to support the bill also? We have been deprived of knowing how OUR representatives would have voted. We encourage you to stay informed and to talk with both your Indiana House and Senate legislators to encourage their support for legislation establishing a nonpartisan redistricting commission during the 2018 legislative session. Democracy is not a spectator sport. This has been the motto of the League of Women Voters and one of the reasons we have chosen to focus on the issue of redistricting for the remainder of this decade. Over and over we hear people say “My vote doesn’t matter/count” or “Why should I vote, no one represents my views/concerns.” Why do so many voters believe these things – and more importantly, are they right? The current redistricting process may be at fault. 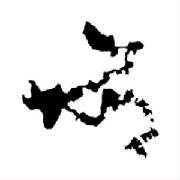 Redistricting occurs by law every 10 years following the census. It has been the privilege of whichever party holds the power in most state legislatures, including Indiana. (Some exceptions exist in Western states such as Arizona and California where the constitutions allow for citizen redistricting committees). The goal of redistricting is to ensure the “one person, one vote” requirement of the US Constitution’s equal protection guarantee, as upheld by the 1960’s Supreme Court. However, redistricting has become an exercise in politicians selecting their constituents (Gerrymandering) rather than districts in which voters have meaningful choices when electing their representatives. Legislators carve out districts that will ensure the re-election of incumbents. This has resulted in discouraging individuals from running for office and parties from slating a candidate in such districts, i.e., an increasing number of uncontested elections. Additionally, voter turnout has been decreasing in both primary and general elections. In Indiana, in the 2014 General Election for example, the average voter turnout was 30 percent. (In the 1990 General Election turnout was 56.7percent.) Primary and Off Year election turnouts tended to be even lower. Meaningful competition is more likely to excite the electorate and lead to a larger turnout resulting in the election of representatives who represent different viewpoints but will work together to reach reasonable compromise in doing the community’s business. The 2015 Indiana General Assembly voted to support the formation of a Redistricting Study Committee, making good on a promise made during the 2014 session. So far only a few members have been appointed to this committee. We urge the timely appointment of remaining members with the intent to have a knowledgeable, diverse, and impartial committee that has sufficient time to generate meaningful redistricting guidelines and a transparent redistricting system. In Indiana the state constitution charges the legislature with the final task of redistricting but doesn’t specify how it is to be accomplished. Serious consideration of the recommendations of the Redistricting Study Committee could lead to more competitive and meaningful elections with greater voter participation, i.e., a truly democratic election process.